Just like pretty much everyone else in the universe, I have been obsessed with the chrome nail trend getting around at the moment. After watching a few YouTube videos I decided to order the few things I needed online and give it a try myself. I was actually really surprised by how easy it was and I promise you can do it yourself too. A LED gel curing lamp. I have this one from my Sally Hansen Salon Gel Manicure Starter Kit ($49.95) that I reviewed here. A gel base coat. I used the Sally Hansen Salon Gel Base Coat that is included in the Starter Kit. A black or very dark nail polish. I used the Sally Hansen Salon Gel Polish in Pat on the Black ($19.95) which is a gorgeous deep wine colour that is close enough to black for my purposes. A gel no wipe top coat. This is very important because it will not work with a normal gel top coat, like the one that comes in the Sally Hansen kit. I ordered the Elite 99 No Wipe Top Coat ($6.59) on eBay. 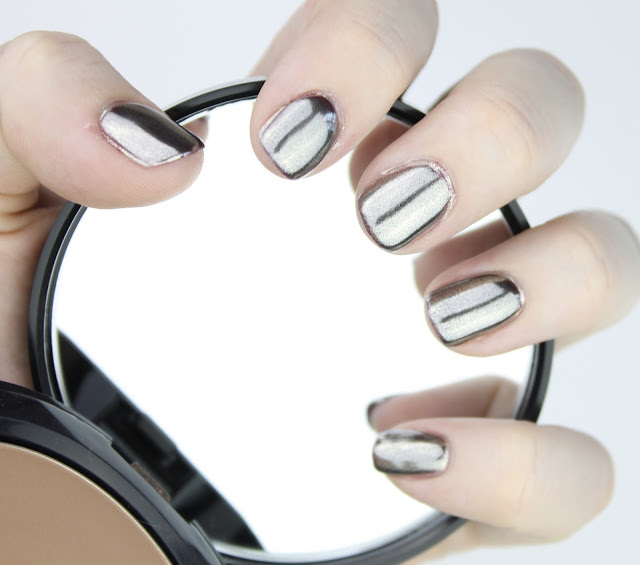 A chrome nail powder. There are tons available online and from various nail art supply stores but I just ordered this cheap one on eBay for $1.65. A fan brush or some sort of fluffy brush to brush away the excess chrome powder. I already had this Designer Makeup Tools one lying around but you can use any. 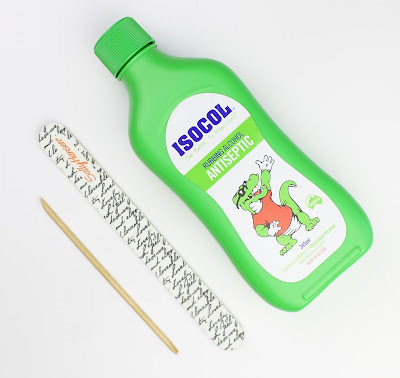 Isocol ($9.99) or any isopropyl alcohol to prep the nails. 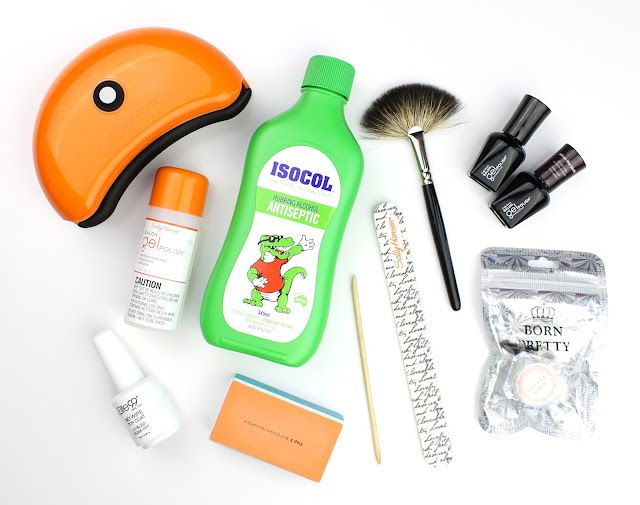 A gel polish remover for when you need to take off the nails. It is best to have this at the ready as well in case anything goes wrong. The Sally Hansen one is the best I've found and even though taking gel polish off is always a pain, it is a little easier with this remover that is included in the starter kit. Any other nail prep tools you like. Technically you could just go ahead and put the gel polish on unprepared nails but it is always going to look neater and more polished if you file your nails and tidy up your cuticles. Buffing your nail beds can also help the polish last longer as well. I love the Sally Hansen No More Ridges Professional Salon Smoothing Block ($4.95), Sally Hansen Nail Shaper Board ($2.95) and the Manicare Cuticle Sticks ($3.59). It is also a good idea to have some cuticle oil and hand cream to condition your hands and nails before and after your mani. So yes, that is a lot but it all works out to just under $100 bucks and, chances are, you probably already have the prep tools laying around anyway. Plus, you will have everything you need to keep doing all sorts of gorgeous, long lasting gel manis. If you already have some gel nail polishes and a dark colour, it will only cost you 8 bucks to get the no wipe top coat and chrome powder you need. Also, you definitely need to use gel polishes for this; it really doesn't work with normal polish. Now for how you actually achieve this look. I use the exact same steps every time I want to prep my nails for polish: gel or normal. First I remove any polish already on my nails, clip any hangnails or broken nails, file and shape them and then load them up with cuticle oil and hand cream. After massaging it in for a few minutes (the longer the better), I use a cuticle/orange stick to push the cuticles back and generally just tidy up the cuticles. This makes such a huge difference and if you are going for a neat, salon looking manicure, you really can't skip this step. Finally, I wash my hands and then finish by cleaning any left over oil or product of my nails with a cotton pad soaked with Isocol. This step dehydrates the nail and gives your polish the best possible plate to stick to. You should always do this, no matter what type of polish you are using, but it is particularly important for gel polish otherwise you will find that the polish just peels right off your nails and doesn't last. Now you are ready for the gel polish. Apply one coat of base coat, two coats of the colour and one coat of the no wipe top coat, curing between each application. The Sally Hansen lamp, like most, has a 30 second timer but if I apply thicker coats I usually cure it twice (two button presses - 60 seconds) just to make sure it is done. It is also worth noting here that the chemical process that cures the polish can heat it up when your nails are under the lamp, particularly if you applied a thick coat. It isn't too bad with the Sally Hansen polishes but the top coat I have got really freakin' hot! A way around this is to just quickly pop you nails under for a quick second until you feel the heat and take them out and wait a few seconds until the heat is gone. When you put it back in, it should be fine. Just take it slow and be careful, particularly with this no wipe top coat. Okay, you are seriously going to be amazed at how easy this step is. First, I would recommend putting a sheet of paper under your hand to catch the powder fall out to make for easy clean up because it is fine and gets everywhere! Then, all you need to do is dip the little sponge applicator into the powder (only use a tiny bit - a little goes a long way) and buff it into the surface of the nail. Make sure you go over it a few times to make it smooth and that you get to the very edges but it really is as easy as that. 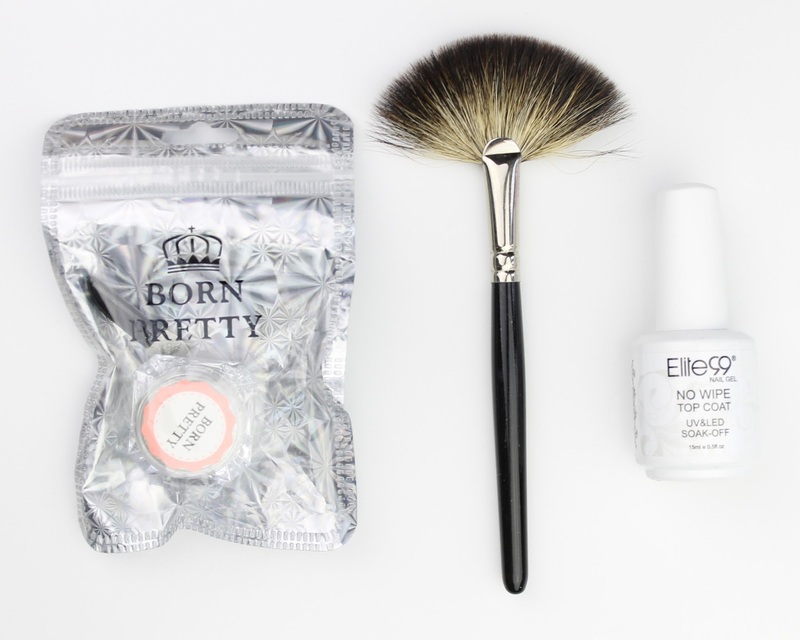 When you are done, brush away the excess powder, trying to get as much out from around your cuticles as possible. Then just apply one more coat of the no wipe top coat and cure one last time. That's it, you're done! Then just wash your hands with some water and try and get the last of the powder out from your cuticles where it does get stuck in the crevice a bit. You don't need to worry about waiting so you don't damage your nails. As soon as you cure gel polish it is good to go and more hardy than any regular polish. Here is a little video filmed to show you how I buff the powder in. I promise, it is as easy as it looks: I am certainly no nail tech! I also kind of enjoyed doing this video. Should I do more nail videos? Maybe I will try the YouTube thing again even though I have zero space to film. I purchased the silver and gold powder and I think I like the look of the silver powder more, even though the gold powder is finer and does give a smoother mirrored finish. Here are some swatches of different colored Sally Hansen Salon Gel polishes and powder combos. Left to right: Pat on the Black with Silver Powder, Red My Lips with Silver Powder, Pat on the Black with Gold Powder, Red My Lips with Gold Powder and Jaded with Gold Powder. All in all, these chrome nails are super easy to achieve at home and I am really happy with the results. I really encourage you to try them at home, especially if you already have everything you need for DIY gel manicure. Will you be trying DIY chrome nails after reading this? If you do please let me know how you go and tag me in your pictures on social media so I can see. 2 comments on "DIY Chrome Nails"
EMMA!! Oh my god! I need to purchase these asap! I have been loving this trend, but hate fake nails!! Going to order right now!! I love the different colour combinations too! Aw thanks so much for reading! I am definitely ordering more shades of the powder. You can even get holo powders that I need to try. I'm so glad you like them though. Make sure you tag me in your pics so I can see how yours turn out.